Well that's your lot from us tonight. See you all tomorrow for more from the League Cup. Enjoy! John Mikel Obi is closing in on a testimonial at Chelsea. He may appear limited in some aspects but he's had nine years at the very top of the game and is a trusted squad member for every manager through the doors at Stamford Bridge. Terry T: To all haters, if Mikel had not played tonight, Fabregas would have slotted in next to Matic and Chelsea would have lost. Fact. and a former Liverpool favourite is the talking point. Barcelona coach Luis Enrique says he is sure record signing Luis Suarez will rediscover his goalscoring prowess. The Uruguay striker has scored three goals in 12 domestic matches since moving from Liverpool for £75m. One of the 27-year-old's goals came on 12 January against Atletico Madrid, who Barcelona face in Wednesday's Copa del Rey quarter-final first leg. Enrique said: "The goals will come because he is a goalscorer and has shown that throughout his career." Chelsea midfielder John Obi Mikel: "We were disappointed to concede the goal but we need to make sure we finish it back home. "We didn't lose and we scored. The away goals count, so we're still in a good place. "Thibaut [Courtois] has been doing this all season, save after save. He showed what a world-class goalkeeper he is." Asked if he would be tempted to make a cheeky bid for Steve Gerrard, Chelsea manager Jose Mourinho told 5 live: "Or perhaps to take him on loan? "I would love the Premier League to keep the best players and I believe he has the quality to play for more years." More from Liverpool manager Brendan Rodgers: "We're getting better with every game, you can see the confidence returning. We were very unfortunate not to win the game. We went behind against the run of play but we created opportunities. "You've seen the return of the aggression in our intensity. The only thing which was missing was more than one goal. You'd expect Chelsea to open up a little more in the second leg and that will help us because of the pace and invention we have in the team. They have got a good record at home but we haven't conceded in our last three games away from home. We know it's going to be a difficult game. It felt like a big game tonight and the performance was big." on Twitter: "Team looked class tonight!!" Tomorrow night sees Tottenham host League One side Sheffield United in the second semi-final, with the follow-up legs next week. Who do you make favourites to reach Wembley? An all-London affair? Chelsea manager Jose Mourinho on Sky Sports: "I'm not saying we are the favourites, I'm saying now the semi-final is one leg. We have to win and Liverpool have to win but it is at Stamford Bridge. "Some people consider the League Cup secondary but a big club like us and a big club like Liverpool respect the competition and that is good for English football." Brendan Rodgers on allowing Raheem Sterling a break: "This is about the boy's life and his career. People will talk about it but I'm only worried about the kid. "You could see tonight he was probably fresher, not so much physically but mentally. He's had so much put on him so early in his career. There is no doubt he is an exceptional young talent." Liverpool manager Brendan Rodgers on Sky Sports: "I'm delighted with the performance, disappointed with the result. We thoroughly deserved to win the game. "We showed wonderful character. Some of our play was very impressive and it sets up the second leg perfectly because they've probably got to open up a bit more. "It's still all to play for. It was a great game and that shows the improvements that we're making." Chelsea manager Jose Mourinho on Sky Sports: It was a proper semi-final and a fair result. Liverpool played well but we were in control. Maybe with a bit more quality in our passing we could score more goals. We were not very efficient in our transition when we recovered the ball. "Thibaut [Courtois] had a couple of good saves and Steven Gerrard hit the post and I don't remember [Simon] Mignolet having saves to make. "We had lots of chances, spaces to counter-attack but our passing was not the best." You may remember that we told you earlier on that Preston gave free pies to the travelling Yeovil fans tonight. Top class. The good news for the bean counters at Deepdale is that only 73 Yeovil fans made the trip. Luke, from Somerset: As a Chelsea fan it can be so frustrating to watch us play sometimes. We've proved before that we can dominate games with our quality yet Mourinho seems to be afraid of doing it and instead puts Mikel in the team who people still seem to think is a good player. Liverpool boss Brendan Rodgers says he is "delighted with the performance, disappointed with the result". Full reaction to come. Jose Mourinho speaking to BBC Sport: "It's a draw. I am not sad as a defeat, not as happy as a victory. My emotion is in the middle. I'm not saying we are favourites now. This semi-final was two legs and now it's only one match and that's at Stamford Bridge. We defended well and our goalkeeper was good. "It was a bit frustrating because the way Liverpool play we recovered lots of balls, and caught them lots of times with just three defenders, but we missed lots of passes in transitions that could have been dangerous." Ken Gorry: I thought this was supposed to be the League Cup was supposed to be meaningless these days. What a game after a very slow start. Niall McCaffrey: I don't understand how people can criticize Chelsea's performance tonight? They successfully executed a game plan, end of. Jake Pincombe: Fans saying Chelsea are a negative side from one game should remember they've scored 20 more goals than Liverpool in the league. Liverpool forward Raheem Sterling speaking to Sky Sports: "Obviously at half-time we were disappointed to be 1-0 down but we said as a group we needed to stay in the game. It was a great comeback from the boys. We tried to keep the ball better and tried to penetrate in the final third. "It's always good to get on the scoresheet and help the team out. I've felt the benefit of the break because there are times you need a bit of rest and the manager gave me some time off and it's helped. We're still in the tie and Chelsea will be difficult but helpfully we can get a result." Chelsea goalkeeper Thibaut Courtois talking to Bein Sports: "Of course after the all the chances we have to happy with the result. They were dangerous and it was a difficult for us. We were not at our best but a 1-1 score is good for the second leg. "They have their new system with quick players so it wasn't easy for us to control it. It was a hard game and to come away with a draw we are happy and now we have to finish the game in front of our fans." Preston miss the chance to go up to third, as they draw 1-1 with bottom club Yeovil. Gozie Ugwu had he Glovers in front before former Wolves striker Sylvan Ebanks-Blake levelled. There were no goals between play-off chasers Doncaster and Notts County at the Keepmoat. Chelsea manager Jose Mourinho says it was a great semi final and it is very good for the Capital One Cup. He is complimentary toward Liverpool, conceding that they did not deserve to lose tonight. Full reaction to come. All over in the Championship. Middlesbrough move to within a point of leaders Bournemouth after beating Cardiff 2-1. Patrick Bamford and Lee Tomlin were on target for the home team before Kenwyne Jones pulled a goal back for the Bluebirds. Bournemouth went down 1-0 against Leeds, who recorded their first win in nine matches. Luke Murphy scored before Giuseppe Bellusci was sent off for the Whites. Yann Kermorgant had the chance to equalise but hit the bar with a late penalty. "Liverpool will feel they deserve to take an advantage to Stamford Bridge after an excellent second half but you would just say advantage Chelsea - thanks to the brilliant goalkeeping of Thibaut Courtois." Patrick Wall: Liverpool's 19 shots to Chelsea's 2. Of which one was a penalty. Proof of a negative side if I've ever seen one. Deniz Eras: As a Chelsea fan I'm disappointed we didn't try to win today. Hate defensive football. David Farrell: Great game. Artistry, pace and trickery vs raw power and toughness. Chelsea will never be loved though. The old classic 'happy with a point' from a cup game there from Thibaut Courtois. Schoolboy error. "Philippe Coutinho, Raheem Sterling, Alberto Moreno, Lazar Markovic and Adam Lallana to a certain extent decided to run at Chelsea at pace. If you've got pace, you can cause the best of teams all sorts of problems. "Sterling's goal was one of those breathtaking moments you see in football occasionally." Chelsea winger Eden Hazard: "It wasn't the best but we are good for the second game. We defended very well and it is a good result. Simon Mignolet has saved penalties from me in training with Belgium so I was a little bit scared!" Goalkeeper Thibaut Courtois: "Considering the chances they had we have to be happy with a draw. We can finish it at home." A strong second half from Liverpool but it still took a moment of inspiration from Raheem Sterling to break the Chelsea resistance. I fancy we could see a very different approach from Jose Mourinho and co next week. "Chelsea were the better team in the first half and deserved their lead but Liverpool were better in the second half than Chelsea were in the first. "They were very good value for the draw. Chelsea would have been surprised by the way that Liverpool came back at them tonight." Dramatic finales in the Championship. At Elland Road, Giuseppe Bellusci has been sent off for Leeds after conceding a penalty but Bournemouth's Yann Kermorgant crashes the spot-kick against the bar. On Teesside, Cardiff have grabbed a lifeline against Middlesbrough as Kenwyne Jones makes it 2-1. All over. The tie is anyone's but Chelsea remain favourites thanks to their goal from Eden Hazard's early penalty. TWO MINUTES added on. A feat of fine dexterity from Thibaut Courtois keeps the ball in as he claims a deflected cross. Liverpool knocking on the door but the late winner doesn't look like coming. Get it to Raheem! "Willian is taking his time going off for Chelsea. Either he's taken a knock or he had an unbelievably hot curry last night." Away goals come into play in the second leg - but only after extra-time. Why? Who knows. It confuses me every year. Chelsea make a change to kill the clock as Cesar Azpilicueta replaces a dawdling Willian. Tom Lafferty: Skrtel must have been brought up in ancient Sparta - quality display! Ada: How many times this season have Chelsea been completely toothless when attacking? Mignolet could take a kip if he wants. Michael Gaffney: Perfectly set up now for Adam Lallana to finish it off. Sylvan Ebanks-Blake has levelled for Preston at home to Yeovil, where it is 1-1. It remains 0-0 between Doncaster and Notts County. There's no waiting around for leg two by the way, same again next Tuesday, at Stamford Bridge. Chelsea to start as favourites as it stands. Another Adam Reach assist helps Middlesbrough establish a 2-0 lead over Cardiff in the Championship as Lee Tomlin gets on the scoresheet. Leaders Bournemouth trail Leeds at Elland Road after Luke Murphy's first-half strike. Marc Pugh has hit the post for the visitors. Not from there, not from there. Philippe Coutinho takes aim from an improbable range and an improbable angle and furnishes the seventh row of the Kop. Inside the final 10 minutes. Setting up a cliffhanger for the second leg? Chris Kelly: Great game best Liverpool performance of the season. They have to win this one! Jon in Watford: Liverpool fans, calm down. Your team are playing at their maximum and at home and they still won't win over the two games. Is funny to see how excited they are getting though. Steve from Cardiff: Philippe Coutinho is just delicious to watch. Chelsea need to take the edge out of the game and for the first time all half they do, getting the ball and keeping it. It's been a very substandard second half from the Premier League leaders. Gary Cahill has had a torrid second half, it's all looked a bit too much for him at the back. Kurt Zouma is waiting ominously in the wings. And what a hit that is! Adam Lallana cracks one on the bounce after Raheem Sterling had chested it down, caught it like a dream, he's half off celebrating but Thibaut Courtois makes a cracking stop! some off-the-field issues at the moment but are currently winning against Championship leaders Bournemouth. Telephone 0500 909 693 or text 85058. "Courtois went to let go of the ball and thought 'this is getting out of my grasp' so he just elbowed it back under his control - outside the penalty area." Pete Nicholson: Coutinho, 22, Sterling, 20, Markovic 20 and Can just turned 21. The future looks bright. MJ: I really don't think Markovic would get into any other Premier League side. Kaushik Gorai: Coutinho and Sterling absolutely destroying the Premier League's best team. Can see the future if kept those two at Anfield. Thibaut Courtois comes out to challenge Raheem Sterling, his momentum takes him out of the box and he maybe just has a hand still on the ball as he slides out of the area. We are talking millimetres though. No decision and the Belgian is able to clear. One more goal in this one? I reckon so. Great hit! Jordan Hendsrson drives one in from 22 yards, a fine hit, it's low and fierce and Thibaut Courtois has to push it out. He pushes it a long way out which makes Raheem Sterling's follow-up difficult. He saves that one too. Alfie Snow: Gerrard's off, time to capitalise! Come on Chelsea! Mark Beedie: Seriously Chelsea - are we going to play in this half or what? Sam Keep: Liverpool are playing the game of their lives here! What a game we are having at Anfield! Adam Lallana almost links up with Raheem Sterling on the edge of the box, a lively intro from the sub. Do Liverpool need to win tonight to reach Wembley? They're giving it everything now. Middlesbrough have finally found a way through against Cardiff. Patrick Bamford, who is on loan from Chelsea, converts Adam Reach's cross to give Boro the lead. As it stands, Aitor Karanka's team go second, a point behind Bournemouth, who trail Leeds 1-0 at Elland Road. "Brilliant piece of play from Liverpool. The ball came to Gerrard. The touch was heavy with his right foot so he tried to pass it in with his left and it was just off-target." Philippe Coutinho down the middle, hits it low, hits it true, and Thibaut Courtois pushes it away! The home side have their hands on the pressure gauge and are cranking it up. Should score! Liverpool should be ahead, and they've been well on top in the last few minutes. The hosts carve Chelsea open down the left, it's cut back to Steven Gerrard, on his left foot. He goes for placement and curls it against the post! Thibaut Courtois was a spectator. Stepan Benyovszky: I hate it when we line up with Mikel. I understand the choice to play an extra defensive player, but he is desperately average. Ash: That break seems to have done wonders for Sterling. Can we send more players to Jamaica please? I could do with a mid-season break in Jamaica. Can you have a whip-round? Raheem Sterling has looked the man most likely all night for the hosts and his goal tonight was top class. Twenty-five minutes left. David McQueen: Where's ya bus now!? Abhishek: That's the Jamaica trip paid off right there! Come on Reds! Shohidur Rahman: Great goal by Sterling. Chelsea's defence split like the Red Sea there. I don't expect Chelsea to change tack after that goal, a draw will still do the job for them tonight. They have still only had one shot all night. "Just as Liverpool were struggling to solve the puzzle of how to lay a glove on Chelsea, Raheem Sterling's individual brilliance puts them right back in this. Fully deserved for an enterprising start to this second half." "It's an absolutely fabulous goal. "That simply was unstoppable. Because of his pace, not one Chelsea defender could get near him and it's a super finish. "The last person he went past was Cahill and he looked like he had rocks in his boots." Brilliant! That is absolutely brilliant. Liverpool haven't looked like scoring all night but they do with a goal conjured up from nothing. Raheem Sterling drops off into the hole, evading Nemanja Matic and then turning in on goal. His pace burns him through the middle, he backs Gary Cahill into the area and then shoots left-footed into the bottom corner from 16 yards. Well taken, and the tie is finely poised again. Mustafa: Moreno is not a winger and can is not a defender! Go figure, Brendan. Duncan, Richmond: The Chelsea bus is well and truly parked! Sheelagh: Why are people saying Chelsea are 'parking the bus' at Anfield tonight? Yes, they're not playing in an all-out attacking manner, but they're also not camping on the edge of their own box. It's just effective game and tie management from Mourinho, it just sounds like sour grapes from Liverpool fans! Are Chelsea just starting to get a bit ragged? John Terry uncharacteristically shanks the ball out under no pressure, and Gary Cahill then scuffs a header out too. On the edge? "Raheem Sterling tried to go around him. John Terry just stopped him at first, completely. He bear-hugged him. It was most definitely a foul." Lazar Markovic, hair blowing in the wind like a young Keanu Reeves, is putting a shift in on the right but he has no end product yet tonight. A scuffle off the ball between Raheem Sterling and John Terry before Sterling sees a shot deflected away from danger. That has lifted the Kop. Tim Purcell: LFC need to unsettle Matic as he is keeping the ball flowing. Rodgers will work it out. People need to lay off him. Chelsea Warrior: Not surprised with our resoluteness in the middle. Matic/Mikel duoploy. Bus well and truly parked. Love it. Christian Stevens: We've had three players up front every time Liverpool get a set piece and we're still 'parking the bus' apparently. "Liverpool haven't changed anything tactically but they are pressing. Chelsea are struggling to get out of their own half but they are a very able team at soaking up pressure. It's what they do." Daniel Sturridge is in the stands wearing a Sherlock Holmes-style deerstalker. Liverpool can't wait to get him back on the pitch, without him they look devoid of threat. The first round of fixtures in the Africa Cup of Nations is almost over. Mali and Cameroon are currently locked at 1-1 with time running out. Here's the place to follow the closing stages. Back under way. No changes for either side. Diego Costa is in right from kick-off but Simon Mignolet sweeps up well to hack it away. Ben in London: As a Chelsea fan, I really dislike the tactics employed by Mourinho, so negative! All the talent, yet allowing an average Liverpool to dominate possession! They should dominate the game in all the ways, even if they are winning! Leon: Wow, ridiculous negativity from reds fans! Chelsea are a great side and I reckon we edged that half. Can has played great at the back since moving there and people criticise as soon as he makes a mistake. Adam in Edinburgh: Proximity to the referee seemed to be the main criteria for yellow cards in the first half. Two soft fouls under his nose both getting cards. Debatable. Here we go, the sides are out at Anfield. Can Liverpool resuscitate this cup tie? Ali Mason: Can't see how Liverpool are going to put the ball in the goal with the 4-1-4 to Chelsea parked in front of it? Gamelephant: Great energy from Liverpool, but it's hard to see Chelsea conceding. James Timpson: Just when you thought the blue bus was tough to breach, they built a Matic extension and now it is almost impenetrable! Chelsea won't change their approach one jot in the second half, you can count on that. It's up to Liverpool now to force the issue. So far it's looking like a good night to be a Yeovil fan. Not only were you treated to a free pie and hot beverage if you travelled to Preston, you've also just seen Gozie Ugwu put your side in front moments before half-time. That's his second in as many games and it could potentially lift the Glovers off the bottom of the table. It's goalless between play-off chasers Doncaster and Notts County, where Magpies midfielder Alan Smith (yes, that Alan Smith) came closest with a 25-yard volley that struck the bar. "What I will say is that the referee is managing to spoil this game. There's hardly been a bad tackle but there's been a few yellows already." Half-time in the Championship. Leeds lead against Bournemouth thanks to Luke Murphy's goal. Middlesbrough have had the better of the chances but cannot find a way past Cardiff. Here's a stat for you: Boro keeper Dimitrios Konstantopoulos has now gone 445 minutes without conceding. There has been a goal in the late game in Africa, as Sambou Yatabare puts Mali up on Cameroon. Follow the Afcon live here. "Chelsea are value for money. They just have a little bit more class in certain areas than Liverpool. "Chelsea love defending. The back four love it. The better the team, they stick their chests out and say 'come on then, try to beat us'." "Liverpool did a lot right in that first 45 minutes but defensive sloppiness led to Emre Can's foul on Eden Hazard and the penalty. Chelsea and Jose Mourinho are experts in this situation but plenty to give Liverpool manager Brendan Rodgers room for optimism." Isaac in London: "Classic Rodgers, playing a new central midfielder out of position at the back and then he gives away the penalty. All big tactics, no small tactics. All the possession you want - but concede a goal. It's all about the details." Richard: Aside from the blue bus, the reason we Reds don't look like scoring is that we don't have a genuine striker on the field. Come back quick Studge! One shot, one goal. That's the story of Chelsea' first half at Anfield. Liverpool have had seven 'attempts' but haven't mustered one real chance of note. Rickie Lambert? Adam Lallana? Fabio Borini? Right, Diego Costa went up for a header and hit the floor, with the ball then striking him on the arm while he was on the deck. Waved away. Dennis Waithera: Chelsea playing so-so And still they don't look troubled at all. Strong mentality? Sean: Who's reffing this? One of Chelsea's subs? Abhinav Singh: No slip, No Bus parking and one full year to learn how to play against Chelsea. What excuse do you have tonight Brendan? For what is essentially a slow, steady game, there's a bit of needle in this. Lucas joins Steven Gerrard in the book and then gives referee Martin Atkinson a mouthful of grief, and seconds later Filipe Luis joins him for a very soft challenge on Lazar Markovic. Liverpool then scream for a penalty for handball as a defender challenges on the floor - nothing given! Leeds' early dominance has paid off at Elland Road and the Whites lead 1-0 against Championship-leading Bournemouth. Luke Murphy puts the hosts ahead with a fine finish. Neil Redfearn's team have not won in their last eight matches. Middlesbrough and Cardiff remains goalless. Steven Gerrard puts his foot in on Eden Hazard and gets a quick booking for his trouble. on Instagram: "This illness might prevent me from helping my team on the pitch but it will NOT stop me from supporting my team off the pitch!! come on guys.. COME ON LIVERPOOL.. YNWA"
It's all getting scruffy and niggly, with more mistakes per minute than a courtroom scene in Broadchurch. Nobody can keep it as we tick toward the interval. Not much going on in the third tier either. Doncaster and Notts County are on 35 points each and victory would put one of them in the play-offs. But that's 0-0 right now. And it's the same at Deepdale, where Preston, who are already in the play-off mix, are goalless with the division's bottom club Yeovil. Nicole Towler: As a Chelsea fan the commentary is scary! Liverpool keeping the pressure which is good for a losing side. Jonathan Liu: Liverpool are still very much in the game despite giving away a stupid penalty. They just need to keep up the high pressure. Blue, Green and Red: Can't see Liverpool getting through this semi-final matchup against Chelsea. The Blues look pretty comfortable at 1-0 up. "Liverpool still showing plenty of composure in their passing but Chelsea looking secure and the pace of Eden Hazard is a real threat to Brendan Rodgers' side. For all that possession, however, Liverpool not applying any serious pressure on Chelsea keeper Thibaut Courtois." "Liverpool were very fortunate. There was one Liverpool defender against two Chelsea forwards. Fortunately for Liverpool, Moreno just did enough to hold the play up and that let his team-mates come funnelling back." One punt downfield and Liverpool threaten to capitulate as Cesc Fabregas is in oceans of space. He looked suspiciously offside but he's waved on and finds Eden Hazard on the underlap. hazard inside, shoot? No. He weaves on and loses the ball. There's a goal on the break in Chelsea though. The benefit of playing Emre Can in a back three is that when he steps out like a young Alan Hansen he can really motor on up the pitch. Can takes it all the way to the edge of the Chelsea box, and tries to pick out Raheem Sterling too. But the pass is just awry. Liverpool get full marks for effort so far, but do they look like hurting Chelsea? No. Adam: Typical Liverpool. Quality + wastefulness = mediocrity. Saidmadrid: Liverpool keeping a high pressure on Chelsea, more threatening and aggressive. Why do they not play like that more often? Craig Walker: Game over Liverpool don't come back against Chelsea or Jose's teams simply don't have the tactical know how to beat Jose. How are those back gardens looking? Here, Liverpool win a corner which skims off Martin Skrtel's head and drifts wide. Jordan Henderson almost releases Lazar Markovic with a cracking pass. But he can't bring it under control. Worried you're missing all the action in the Championship? Don't be. No goals so far at Elland Road, where Leeds have started well against leaders Bournemouth or at the Riverside Stadium, where Patrick Bamford has gone close for Middlesbrough against Cardiff. Liverpool's sprightly spell just before the goal is already starting to feel like a distant memory. Chelsea look happy to shake hands on a 1-0 win now and go home for the second leg. They're sitting in and seeing what the Reds have got. Four Leaf Ent: Typical Liverpool. We have all the pressure then concede a silly penalty. Hashim: Stonewall penalty. Clumsy and late from Can, who already looks in trouble defending Hazard. James Lee: Surprised Mirallas didn't take that penalty. Raheem Sterling gets behind John Terry but his touch takes him wide and the chance has gone. Chelsea sitting deep but leaving Eden Hazard well up the field on the left wing. If ever there was a side built to contain a one-goal lead and hurt you on the counter it's this Chelsea side. Liverpool in trouble now. Do they come out and go for it? OR stay drilled and cautious? "I think Eden Hazard bought that cleverly. There is contact and my first thought is it's clumsy. The referee was in a great position. "Yes it is a penalty. Liverpool will feel it's soft but I can understand why it's been given and it's a great penalty." It never, ever looked in any doubt. Eden Hazard steps up with a degree of confidence and plants it into the bottom corner. For the second night in a row on Merseyside a Belgian in blue takes a penalty kick. This time he finds the net. Clumsy. It's very clumsy from Emre Can as he sticks his backside across the run of Eden Hazard and dumps him to the floor. A penalty at the Kop End. "Liverpool will be pleased with their start. They have forced Chelsea to hurry at the back on a number of occasions as they have applied pressure and look the more convincing of the two sides going forward. In other news both sets of supporters have spent the first 15 minutes exchanging Steven Gerrard songs." That's what he's al about! Cracking drive from Steven Gerrard, 30 yards out with a bucketload of dip and a side order of swerve, Thibaut Courtois has to backtrack and punch it over. Fine hit. Liverpool now firmly on top. "Great idea by Coutinho. I thought he might have taken a touch to his left and whacked it but great work by Gary Cahill." And Liverpool do keep the pressure on, Philippe Coutinho spins away from John Terry and lays the slide-rule pass into the run of Raheem Sterling, he's in but Gary Cahill toes it back to the keeper! Backpass? No chance. Good play though, and Anfield is aroused. Excitement! Minor excitement, that's better. Jordan Henderson drives into the box but his pass is cut out before Alberto Moreno wins a corner. Well cleared by Diego Costa. Liverpool looking to build and apply some pressure. "The only pattern of play is there is no pattern of play." 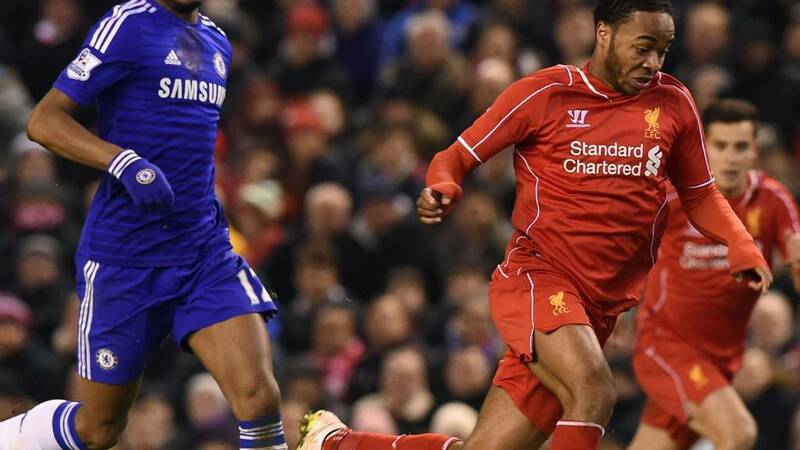 Bob: Chelsea are man-marking Sterling which is a good compliment to the lad! Liverpool must have something to take to the Bridge. MJF: So begins the first of 10 consecutive crucial games for Liverpool; 5 league and 5 cup. This is where the season will be decided. is just about to start on the other side. Whack that on, I'll let you know if anything happens. A contender for dullest opening 10 minutes of the season so far. And don't forget, we've got two legs of this! Someone have a shot, a dribble, a tackle even? "Branislav Ivanovic is the go-to man for Chelsea. He's nominally right-back but he's got acres of space. I remember he played that role against Manchester City last season and he scored the goal." The two sides appear to have signed some sort of agreement to keep the ball within a 25-yard radius of the centre-circle at all times. "Liverpool defensively look a much better unit with three at the back. Sakho isn't the best with the ball but he's very good defensively and he's found some confidence in recent weeks." Thibaut Courtois is played into trouble as John Terry gives him a hospital ball, the Belgian has to dribble around Steven Gerrard and then shanks his clearance into the main stand. A rare lack of composure from the keeper - who must be wondering if Petr Cech is back as number one now. follow this Scottish Premiership game. It's a cold night but Yeovil fans have been given a warm welcome at Preston in League One - North End are offering visiting fans a free pie and and hot drink as a reward for making the 480-mile round trip. The flurries of snow are not sticking, no danger to man or beast at Anfield. Both sets of fans exchange songs about Steven Gerrard. Liverpool start as expected with a back three as Cesc Fabregas operates in the hole behind Diego Costa for Chelsea. Liverpool keeping the ball very well in the opening moments as Chelsea let them have it in their own half. James Griffiths: I'd rather see Mario Balotelli given a real go in the team than Rickie Lambert or Fabio Borini, What's going on Rodgers? Steven in Derry: Can has a lot of experience at centre back, I wouldn't fancy lining up against him even if I was Diego Costa. James in Weybridge: Wearing my trusty Liverpool apron tonight, while working in a Chelsea fans pub. Could go either way! "We'll sing what we want" is I believe the witty riposte most sets of fans fall back on when they are told not to sing something. Steven Gerrard applauds the old ground. He'll miss this when he's playing the Colorado Rapids. "Not often the words of Jose Mourinho fall on deaf ears with Chelsea fans - but they have totally ignored his plea not to sing the song taunting Liverpool captain Steven Gerrard for the slip that let Demba Ba in for that crucial here at Anfield late last season." Liverpool: Mignolet, Can, Skrtel, Sakho, Henderson, Gerrard, Lucas, Moreno, Markovic, Coutinho, Sterling. Subs: Jose Enrique, Lambert, Manquillo, Lallana, Borini, Rossiter, Ward. Chelsea: Courtois, Ivanovic, Cahill, Terry, Luis, Matic, Mikel, Willian, Fabregas, Hazard, Costa. Subs: Cech, Zouma, Ramires, Oscar, Drogba, Remy, Azpilicueta. The yellow ball is out, here come the teams. All set? Liverpool manager Brendan Rodgers speaking to Sky Sports before kick-off: "We are in a different moment to when we met Chelsea in the Premier League. Even though we took the lead in that game I never felt that we were never comfortable. We are much more confident now. "Tonight it will be a tight game. The objective is to make sure we are in the game for the second leg. Ideally you want a lead going into that second leg, but a 0-0 or a draw is not always a bad result. You don't need to win the tie outright here." Chelsea manager Jose Mourinho speaking to Sky Sports before kick-off: "We are always confident, but we know that it is always tough against Liverpool, and it is always difficult at Anfield. So I think it's best to forget the last two good results that we had here and focus on now. We are not excepting an easy one. "I selected John Mikel Obi ahead of Oscar because we play against a good team. This is only the first half of the match, and we know Liverpool are strong going forward with fast, creative players. I think it's important to bring one fresh player to give us stability in midfield. "At this moment I want to win the game, but maybe the game goes in a different way where a draw is a good result. If we play well and get a draw I will maybe not be so happy, but if Liverpool play well and we get a lucky draw then I would be happy." Himanshu Singh: Somehow a feeling of 2-0 home win. Rian Hoskins: I'm surprised that Andre Schurrle isn't even on the bench. Was starting to get confidence back but this could set him back further. Kaushik Gorai: Steven Gerrard makes Liverpool side very slow. And against this sprinters of Chelsea, Bad Choice. Willian to destroy him today. "First flecks of snow falling here at Anfield and groundstaff out working on the pitch towards the end where Chelsea's fans are gathered - surface looks good, weather forecast not so good." I've just seen a Chelsea fan who has got his matchday attire all wrong this evening. A baseball cap and a thin, almost tracksuit top, are not what the weather gods called for in Merseyside tonight. I'd be going three pairs of socks, thermals, jeans, old work boots, two t-shirts, a wool jumper, my big dog-walking coat, fingerless gloves, a scarf and a bobble hat. And I'd still be cold. Jenni in Newtownards: It'll be refreshing to see Cesc Fabregas playing in a more advanced, attacking and free role in front of both Nemanja Matic and John Obi Mikel tonight. The other two will hold the fort, while Fabregas can now roam free in midfield. Be afraid Liverpool, be very afraid! Forget what I said about the weather at Anfield, snow flakes have just started to fall. It's nothing too major but you can expect the long sleeves and glove count to ramp up. Alistair Rodgers: Liverpool are finished. They had one year where they over achieved last year. They won't get anywhere near top four for a long time to come. Bob Horton: Sakho and Can are gonna get munched. I feel sorry for Can being played out of position. Michael Brannan: It'll be a tight one, one goal either way I think, but hope it's for us! Come on you reds!! Ned, a Cardiff fan: Completed the five hour trip to Middlesbrough. three points would make the journey back bearable! Liverpool may need goals, but there's no place for Mario Balotelli again in their squad. Adam Lallana, Fabio Borini and Rickie Lambert are all on the bench. Is Balotelli (at best) fourth-choice now? He's the League Cup of Liverpool strikers. Andy in Somerset: Liverpool need to win by at least two clear goals to have any chance of progressing, I think we can do, fancy Lazar Markovic and Raheem Sterling to score and Simon Mignolet keeping another clean sheet. Also a bonus Oscar isn't starting. Andy in Armagh: Anytime a team managed by Jose Mourinho goes up against a Liverpool side there's always high drama. As a neutral I'm really looking forward to this one. My money's on a narrow away win in a real battle of a game. William Dobbs: Liverpool have to get goals in this first leg to have a chance of getting through - I just can't see where they're coming from in that line-up. "Freezing temperatures at Anfield as the old rivalry is renewed with Liverpool meeting Chelsea in the first leg of the Capital One Cup semi-final. Chelsea manager Jose Mourinho has called for their fans to show respect for Liverpool captain Steven Gerrard - still taunted about his slip against these opponents at Anfield in April as Liverpool slid to a defeat that proved so costly in a Premier League title context. "Gerrard is leaving Liverpool for LA Galaxy at the end of the season and their fans know what they want. A banner held up in the Main Stand is emblazoned with the words 'Get Gerrard To Wembley' - and the captain is back tonight, replacing striker Fabio Borini in the only change from the side that won at Aston Villa on Saturday." "Liverpool's season has been average compared with the last couple of years but they are getting there. "The lads they've bought have started to improve. Sometimes it takes half a season to do that but in terms of a patch on last season, they're a long way away." Martin Odegaard is perhaps the best Liverpool fan in the world. Ok, so he's maybe not the most committed. And he maybe hasn't been drinking around Europe with Jamie Carragher's dad. But he has the world at his feet. If you're not familiar with his work, the 16-year-old has been likened to Lionel Messi and wooed by the likes of Real Madrid, Manchester United and Bayern Munich in recent weeks. here are 10 things you may not know about him. on Twitter: "In the Kop end. New Gerrard banner is boss." The banner reads "The best there is, the best there was and the best there ever will be." "In the area where Nemaja Matic and John Obi Mikel are playing they're up against Philippe Coutinho and Steven Gerrard. A little bit of ballast in front of the back four. "Jose loves to win here, He understands the history and tradition and he loves beating Liverpool." Andrew Neill: While I'm all in favour of strong line-ups, this seems the perfect opportunity to give Kurt Zouma a bit more game time. Navneet Gautam: LFC fans saying Chelsea aren't playing defensive like last season. Well, LFC don't really have strikers to be scared of anymore. Nick Moreland: Emre Can starting in a back three against Diego Costa and Eden Hazard? Interesting. "This is now Brendan Rodgers' team. He's been here for two-and-a-half years and he's implemented his own players. "He's the only manager who's had to manage with Steven Gerrard coming to the end of his career and Jamie Carragher packing in. Two or three years ago, with those two at full tilt, this would be a completely different team." A late call off as The New Saints FC v Carmarthen falls prey to a frozen pitch but there's no such worries at Anfield, where it looks cold but fine. The ground is slowly filling up, that chippy behind the Kop will be packed. The League Cup was the first trophy Jose Mourinho won with Chelsea in his first spell a decade ago - will it be the first silverware of his second stint in charge? Chelsea won the League Cup in 2005 against - you guessed it - Liverpool. Mateja Kezman was the unlikely hero of the hour, scoring the winner in a 3-2 win in Cardiff. Liverpool's second goal by the way was scored by a contender for 'worst makeweight in a swap deal' of all time. Remember Antonio Nunez? When Michael Owen signed for Real Madrid Liverpool got a player in exchange. They didn't make the most of it. Dawid Zaborowski: Nice to see a strong line-up from Chelsea. We usually rest our key players but this time it looks like we will go for the win! TalkMerseysideCity: It is clear that Rodgers's approach to this game is to get a draw so that we have a bit of work to do in the second leg. Djethro Colmer: Chelsea's approach doesn't matter. They simply won't be beaten over two legs, their mentality is excellent. Chelsea manager Jose Mourinho says failing to sign Liverpool's Steven Gerrard remains one of his greatest transfer disappointments. Mourinho was close to signing the midfielder in his first spell as Chelsea manager in 2005 before Gerrard chose to stay at Anfield. "We did everything to try [to sign him] and it was almost there," said Mourinho. "I was dreaming of Claude Makelele, Gerrard and Frank Lampard in midfield." Mourinho added: "We were playing in a proper triangle without a number 10 and playing Maka in front of the defenders. Me, Mr Abramovich and [former Chelsea chief executive] Peter Kenyon at that time, we dreamed of that. "His people were open to him joining a top side like Chelsea. But to me personally he never said he would come. Never." It's the wrong cup but if we have half as good a game as this classic Liverpool semi-final, we'll be happy tonight. Click here to watch highlights from 1990 when Crystal Palace took on Liverpool in the FA Cup semi-final at Villa Park. Steve Coppell and Kenny Dalglish faced one another in the dugout for this clash, with Coppell's Palace having been turned over 9-0 in the league by Dalglish's Liverpool earlier that season. Palace were without key striker Ian Wright and were clear underdogs against the team that would finish the season as Division One champions. Watch more classic FA Cup match edits here. Chelsea were in sensational touch at the weekend as they wiped the floor with Swansea, which led to manager Jose Mourinho praising a "perfect game." But he still had time for a gripe, warning his players they must win titles if they want to be remembered. A League Cup for starters boss? Brendan Rodgers knows how to stoke us all up, as he proclaims that "0-0 is not a bad result." Radio 5 live is brimful of League Cup action tonight. Build-up from Anfield starts at 19:00 (GMT), with match commentary starting at 19:45. John Murray is the main main with the mic, ably assisted by former Liverpool defender Mark Lawrenson on summariser duty. After the match, it's your turn to get involved with the Football Social from 22:00. Call 0500 909693 to have your say. follow all the Afcon 2015 action as it continues at 19:00 (GMT) when Mali take on Cameroon to complete the first round of fixtures. Cameroon stormed through qualifying, coming through their group unbeaten, having conceded just one goal. Roma midfielder Seydou Keita, 35, starts for Mali as he features in his seventh Cup of Nations. William Jameson: It's clear what Chelsea's approach is. Blitz Liverpool in the first leg, and then rest players for the second! Femi John Atoyebi: Mourinho in a smash-and-grab-approach. Lewis Tizard: We (Liverpool) have to beat Chelsea tonight to stand any chance of going through as getting a win at the Bridge will be hard! In League One, Preston have the chance to get their promotion push back on track when they entertain bottom club Yeovil at Deepdale. Simon Grayson's side are fourth in the table but have won only once in five matches in all competitions, while Yeovil beat promotion hopefuls Bradford on Saturday to end a run of five straight defeats. Doncaster can go above Notts County with victory over the Magpies in a midtable battle at the Keepmoat Stadium. Tenth-placed Notts are on the same points as Rovers, who are 14th. Both matches kick-off at 19:45 (GMT). The match between Oldham and Rochdale that was due to take place tonight was postponed yesterday. Paul Hansen: Have you got Chelsea's line-up right? They usually play a flat back 10 at Anfield! UnSimpleSimon: Why rest Fabio Borini when he's just scored a goal? Sam Harris: Liverpool to win 2-1 tonight with goals from Stevie G and Skrtel. draw 1-1 with Guinea as the Elephants began their Africa Cup of Nations campaign. Mohamed Yattara gave Guinea a shock lead and things got worse for Ivory Coast when former Arsenal forward Gervinho was sent off for violent conduct. Ivory Coast featured Yaya and Kolo Toure in their starting line-up and they helped salvage a draw when Seydou Doumbia scored with 18 minutes left. Tonight's second Championship game sees Middlesbrough aiming to keep pace with the top two. Aitor Karanka has seen his in-form side lose just one of their last 14 games, and haven't lost at home since the August Bank Holiday. Look up 'midtable' in the dictionary and you'll find a picture of Russell Slade's Cardiff. Ten points off the play-offs, 11 points off the relegation places. Going nowhere. Get used to the idea. The Cherries have been up near the top all season and a win tonight would see them open up a four-point gap on the chasing pack. Eddie Howe's side travel to Elland Road in confident mood, too. While the men from the south coast have lost one league game since September, Leeds can't buy a victory. Neil Redfearn's boys have not won any of their last eight games in all competitions, losing five. They are in real danger of a return to the third tier. Both sides have named very strong teams then, we're set for a cracker. But how will Chelsea approach the first leg away from home? Will they shut up shop or go for broke? And what do Liverpool need from leg one to stand a chance of reaching Wembley on March 1st? What's the opposite of a 'like-for-like' change? Chelsea make just two changes as Oscar is replaced by John Mikel Obi and Thibaut Courtois is back in nets. Chelsea XI: Courtois; Ivanovic, Cahill, Terry, Filipe Luis; Matic, Mikel; Willian, Fabregas, Hazard; Diego Costa. The Ringo Starr of trophies. The Ashley Giles of trophies. The Jack Swigert of trophies. The League Cup may well be fourth-choice in a big team's priorities at the start of the season but once you've got this far you may as well win it. Liverpool's haul of eight is the most of any side, while Chelsea's four titles sees them in equal third alongside Manchester United, Spurs and Nottingham Forest. Will they hit five this season? Liverpool make one change from the side which beat Aston Villa at the weekend. Steven Gerrard starts and Fabio Borini drops out. Phil Thompson. Graeme Souness (x3). Ian Rush. Robbie Fowler. Sami Hyypia. Steven Gerrard. Terry Venables. Dennis Wise. John Terry (x2). On 12 occasions a captain of either Liverpool or Chelsea has had the pleasure, the honour, of lifting the League Cup trophy high above his head and starting the party. This season's tournament has already rolled round to the semi-final stage and John Terry and Steven Gerrard are edging closer to another chance to get their hands on the trophy. But first they must get through a two-legged semi-final. Tonight it's leg one at Anfield. Who will be thinking about ordering the Wembley suits at full-time?